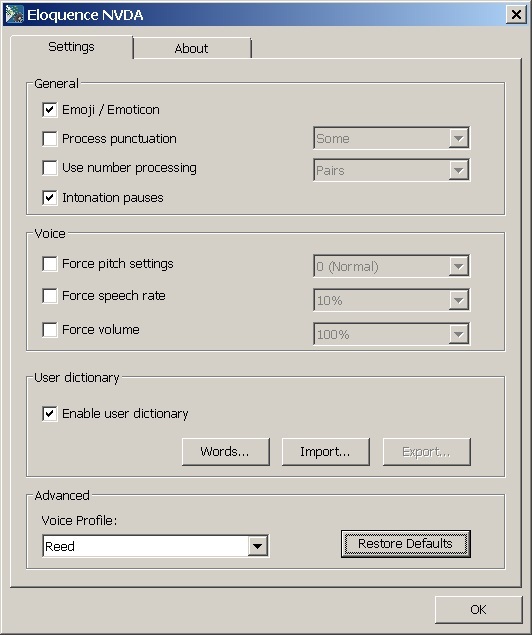 The add-on consists of popular Eloquence and Vocalizer Text-To-Speech synthesizer to be used with NVDA. Code Factory believes in developing simple yet powerful solutions that help users enjoy the computing experience and be productive in their personal as well as professional lives. 2 most popular Text-to-Speech synthesizers bundled together as one product. Seamless integration with the widely popular open source NVDA screen reader settings. 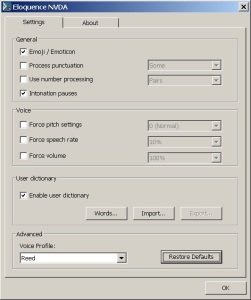 Comprehensive options for text processing included in app settings. Compatible with Portable version of NVDA for ease of use on different machines. User Dictionary: possibility to add, edit or remove words from a dictionary to customize the pronunciation. 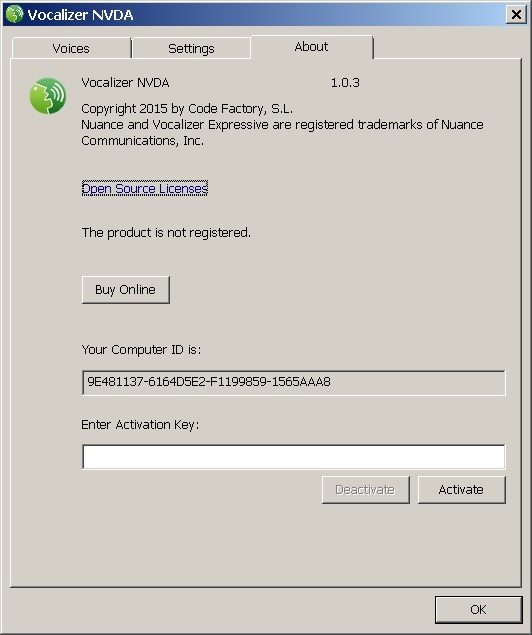 Once the Add-on is installed along with NVDA, you can select either Code Factory Eloquence or Code Factory Vocalizer in the NVDA Synthesizer dialog and then select the preferred language in the NVDA Voice dialog. 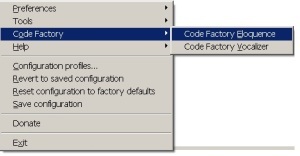 All versions of Windows Vista and above are compatible with Code Factory Add-on for NVDA. 10% of all sales of this product are donated to NV Access to support the NVDA project. NVDA add-on is also an application that extends the functionality of NVDA. There are many add-on available for NVDA and can be checked from NVDA Context menu > Tools > Manage add-ons. What languages and voices are supported? 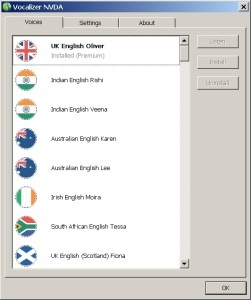 With Vocalizer: Australian English, Irish English, Indian English, UK English, US English, South African English, Scottish English, Arabic, Argentinian Spanish, Basque, Belgian Dutch, Bengali,Bhojpuri, Brazilian Portuguese, Bulgarian, Canadian French, Cantonese, Castilian Spanish, Catalan, Chilean Spanish, Colombian Spanish, Czech, Danish, Dutch, Finnish, French, Galician, German, Greek, Hebrew, Hindi, Hungarian, Indonesian, Italian, Croatian, Japanese, Kannada, Korean, Malay, Mandarin, Mandarin Taiwanese, Marathi, Mexican Spanish, Norwegian, Polish, Portuguese, Romanian, Russian, Slovak, Swedish, Tamil, Telugu, Thai, Turkish, Ukrainian and Valencian languages with at least one voice is supported. What is Code Factory Add-on for NVDA? It is the bundle of Nuance Eloquence and Vocalizer TTS application that can only be used with NVDA. What is the difference between Eloquence and Vocalizer Add-on for NVDA and SAPI Version of Eloquence for Windows from Code Factory? At first, the Add-on is a bundle of Nuance Eloquence and Vocalizer where as the SAPI version of Eloquence is separate product. The main difference is, the add-on can only be used with NVDA where as the SAPI version can be used with any screen reader or with any application that uses the SAPI TTS voices. What is the price for the Code Factory Add-on? The add-on is of EUR 59 and the price may change depending on the currency conversion rates. Can I use Code Factory Add-on with NVDA portable version? 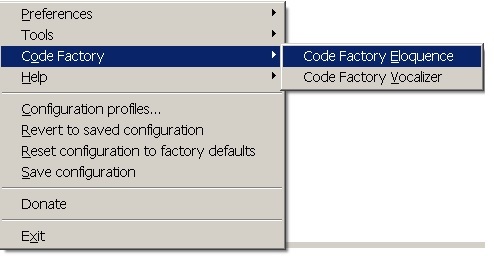 Yes, Code Factory Add-on can be used with the portable version of NVDA. Keep in mind that you would need to activate the license on the computer you wish to use the Portable version of NVDA and you must deactivate your license when leaving the system. This is very important if you wish to use the license on public system. On how many machines can I register my Code Factory Add-on for NVDA license? Similar to SAPI version of Eloquence, the NVDA add-on license can also be activated on 3 machines. What if I by mistake uninstall NVDA or the Add-on without deactivating the license? Don’t worry, as long as you use the same computer the Computer ID will not change. This way, you can install them again and first should activate the license and then properly deactivate the license to free up your one key to be used on other computer. On what versions of Windows will it work? Windows Vista, Windows 7, Windows 8 and 8.1 and Windows 10. Yes, support is provided for Windows 10 desktop. However, due to technical restrictions, it will not work on Windows 10 mobile devices. Does it work on both 32-bit and 64-bit versions of Windows? Yes, both 32-bit and 64-bit versions are supported and will be installed automatically depending on your OS. How can I download the software? Where can I find the application after installing it? A shortcut will be automatically placed on your NVDA Context menu after installation process. Is there a free trial of the software? Yes. When opening the software for the first time, click on the “Trial” button to receive your free 7 day trial license. My trial has expired but I still need more time to evaluate the product. Can I extend or reset the trial? No, the trial is associated with your PC and it is not possible to extend or reset a trial license on a PC once it has expired. You can however trial the software on a different PC. Are there any differences between the trial and full version? No, the functionality is the same in the trial and full version. Please download and install and select the “Buy now” option inside the app to purchase your license. You can use either credit card or PayPal to purchase, using the 2checkout payment gateway. After payment has been accepted, your activation key will be sent by email to the address that you provided in the purchase process. I purchased the software but now I want a refund. How do I get a refund? Unfortunately it is not possible to get a refund. For this reason, we offer a full-featured trial, so that you can fully test the software before purchase and decide whether or not it meets your needs. The activation key which you will receive by email after purchasing your license will allow you to activate the software on up to three of your personal computers simultaneously. The email also contains the instructions explaining how to activate for the first time. Keep it safe since you will need it if you need to activate in the future on a different computer. Your license status will be checked automatically at regular intervals, so be sure to connect your PC to the Internet at least once a month. You can move your licenses between different computers by clicking on the “Deactivate” button inside the “About” tab. Follow the process through to the end to receive your confirmation that the deactivation was successful. You can then activate again on a different computer. No, the license is permanent, although there will be regular automatic checks of the license, so make sure to connect to the Internet at least once a month. Yes, you need an Internet connection to start your trial period and to activate for the first time. In addition, you’ll need to connect to the Internet every now and again (at least once a month) in order to allow the software to perform its automatic license check. Will new versions of the application work with my current license? Minor updates will be supported for free by the current license. I lost the email that contains my activation key that was sent to me when I bought the product. How can I retrieve it? Your license was purchased using the 2checkout payment gateway, which keeps track of all your purchases made via the gateway. To retrieve your activation key, go to https://secure.2co.com/myaccount/ and login to myAccount using either the email address you used to make the purchase or the Order ID. Once you enter into your account, click on the “My Products” page to recover the activation keys for all your purchases. I own two PCs. Can I use the product on both of them at the same time, without needing to purchase another license? Yes, you can activate your license on up to three of your personal computers using the activation key which was sent to you when purchasing the software. My friend likes the product and wants to use the product on his PC. Can I use one of my activations to activate the product on his PC, so he can use it? No, the license is individual and it is not permitted to use your activation key to activate the software on other people’s computers. I have some friends who also want to buy the product. Can we get a discount if we purchase the product together? Yes. On the purchase page, click on the “Volume discount prices” link just below the product name. You will see that there is a 5 Euro discount per license if purchasing between 3 and 9 licenses, and a 10 Euro per license discount if purchasing 10 or more licenses (or the equivalent in your currency of purchase). If purchasing multiple licenses, you will receive multiple activation keys by email, so the person receiving the email will have to pass the activation keys to each person who has purchased the license. Is my license transferable to another person? No, the license is individual and cannot be transferred to another person. I have a valid license, but when I started my PC today, the screen reader kept saying “Please register this product”. What is the problem? If you do not connect your PC to the internet for more than a month, then the regular license activation check will not be able to be done and the license will expire. If this occurs, connect your computer to the Internet, open the application and follow the steps to re-activate your license. I’m selling my PC and buying a new one. Will I need to buy a new license for the new PC? No. All you need to do is deactivate your license on your old computer (in About > Deactivate) and once you receive your confirmation message, the license will be deactivated and you can then reactivate it on your new computer. My hard drive crashed and needed to be reformatted. Will I lose my license? No, as long as you re-install the same licensed operating system as before. All you need to do is reinstall the software and register it again and the previous license will be recovered. My PC was stolen. Will I lose my license? Since you could not deactivate the license on the stolen PC, one of your three licenses will still be associated with your old PC. However, you can still use one of the two remaining licenses to activate the product on your new PC. In case of problems, please contact Code Factory’s customer support by opening a ticket. I’m going to upgrade/format the hard drive, or change the operating system of my PC. Do I need to do anything before making this change? Yes. Before making any major change to your PC (e.g. replacing/formatting the hard drive, upgrading the operating system, changing the processor), you should deactivate your license. After making the change to your computer, re-install and activate the software using the normal procedure. I’m going to the public library today to spend a few hours working on a public PC. Can I use one of my activations so I can use the app on the library PC? Yes. You’ll first have to install the Add-on along with NVDA on the public PC (for example via the download web page, or by copying the installation file to a pen drive and installing it on the public PC) or you can use the NVDA Portable version. Once installed, you’ll be able to use one of the three activations associated with your activation key to temporarily activate the license on the public PC. WARNING: it is very important to remember to deactivate the license when you are finished working on the public PC, since otherwise one of your three activations will remain associated with the public PC and you will not be able to use it. 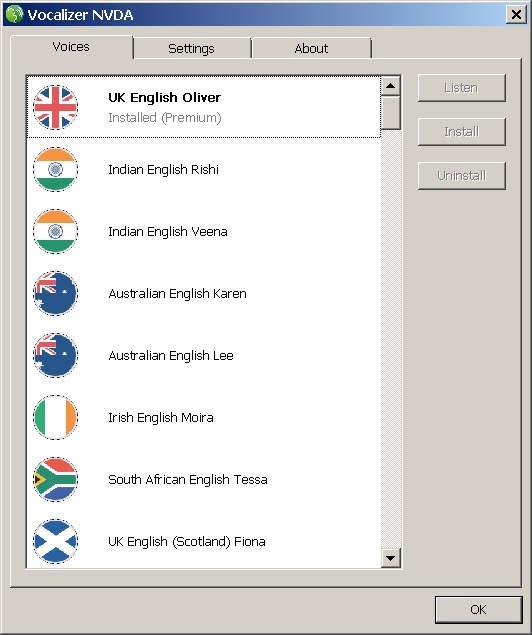 Is the User Dictionary compatible with your Android versions of ETI-Eloquence and Vocalizer? Yes, the User Dictionary in our Windows products is compatible with the one in our Android products and can be interchanged. I have some additional support questions. How can I get support?